The Alfa Romeo SZ (Sprint Zagato) or ES-30 (Experimental Sportscar 3.0 litre) is a high-performance limited-production sports car/road-concept car built between 1989 and 1991 with partnership via Centro Stile Zagato, Centro Stile Alfa Romeo and Centro Stile Fiat. 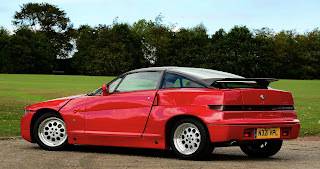 It was unveiled as ES-30 in 1989 Geneva Motor Show as a prototype by Zagato, although the car was mainly built by them - not designed mechanically. Robert Opron of the Fiat design studio was responsible for the initial sketches while Antonio Castellana was largely responsible for the final styling details and interior. Only the 'Z' logo of Zagato was kept. The car possessed unusual headlights positioned in a trio on each side - a styling used more subtly on later Alfa Romeos in the 2000s. 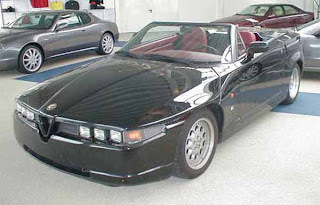 Mechanically and engine-wise, the car was based on the Alfa Romeo 75, production being carried out by Zagato at Terrazzano di Rho near the Alfa factory in Arese. The thermoplastic injection moulded composite body panels were produced by Italian company Carplast and French company Stratime Cappelo Systems. The suspension was taken from the Alfa 75 group A/IMSA car, and modified by Giorgio Pianta, engineer and team manager of the Lancia and Fiat rally works team. A hydraulic damper system was made by Koni. The SZ was originally equipped with Pirelli P Zero tyres (front 205/55 ZR 16, rear 225/50 ZR 16) and is able to sustain over 1.1 G in cornering, some drivers have measured a cornering force of 1.4 G, which remains an excellent performance figure. 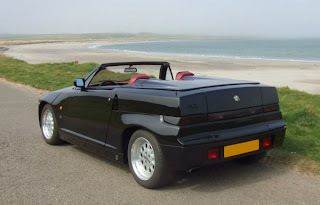 The two-seater hard roof version also saw a convertible version, the RZ (for Roadster Zagato), produced from 1992 until December 1994. Although almost identical to look at the two cars had completely different body panels save for the front wings and boot. The RZ had a revised bumper and door sills to give better ground clearance and the bonnet no longer featured the aggressive ridges. Three colours were available as standard black yellow and red, with black and yellow being the more popular choices. Yellow and red cars got a black leather interior and black cars burgundy. Although the interior layout was almost unchanged from the SZ, the RZ had a painted central console that swept up between the seats to conceal the convertible roof storage area. 350 units were planned but production was halted after 252 units when the Zagato factory producing the cars for Alfa Romeo went in to receivership, a further 32 cars were then completed under the control of the receivers before production finished at 284 units, making the RZ the lowest production Alfa Romeo ever produced. Of those final three were painted silver with burgundy interior and another pearlescent white. 1036 SZs were produced (planned: 1000), about 100 were exported to Japan. Last updated on 12 March 2014 at 04:08.